SAT offers a range of industrial ovens specifically adapted to all curing processes: pre-impregnated, RTM (resin transfer moulding), infusion, filament winding, honeycomb drying, curing, post-curing, pultrusion, thermoforming, etc. 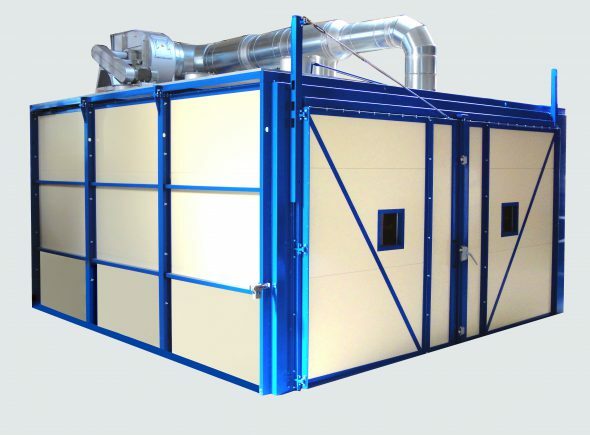 SAT composite curing ovens are already used not only by the most prestigious aviation equipment suppliers but also in the automotive and sports industries. Temperature: precise and controlled thermal cycles (temperature rise, fall and uniformity), and an air flow adapted to the weight and shape of your moulds. Able to exceed 450 °C, our ovens allow the use of all thermosetting and thermoplastic resins. We also offer a very complete user-friendly supervision system capable of managing all the parameters (temperature cycles, vacuum, pressure, resin injection, encrypted recording complying with AMS, CQI9 and NADCAP, batch management), etc. Complete infusion line incorporating oven, vacuum system, resin injection system and general supervision. Composite fan blade curing oven, temperature 180 °C. Oven for infusion process, 250 °C.